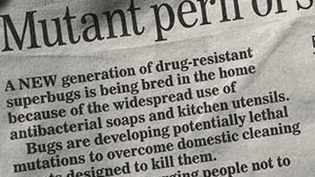 A NEW generation of drug-resistant superbugs is being bred in the home because of the widespread use of antibacterial soaps and kitchen utensils. Bugs are developing potentially lethal mutations to overcome domestic cleaning agents designed to kill them. Experts are now urging people not to buy such soaps and utensils. The threat was revealed in research by Professor Laura Piddock and Dr Mark Webber, from the University of Birmingham, who showed how the common food bug salmonella developed resistance to cleaning agent biocide used in soaps and washing-up liquids.